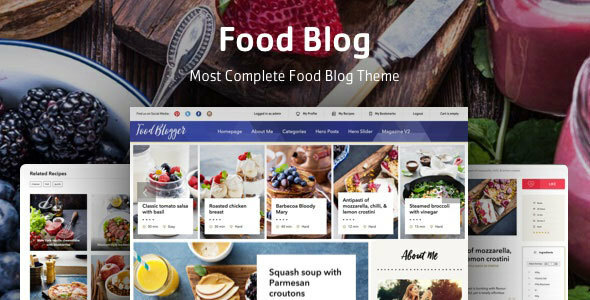 Created with food bloggers in mind by the authors of a top selling food blog themes, show off your personal cooking blog with simple and clean layout, sliding featured recipes and much more. Weâ€™ve specifically focused on food bloggers and asked them what exactly do they need, weâ€™ve integrated some awesome features like a super easy to use ingredients builder, nutritional data box and informative steps with photos for making it easier for your followers to cook your recipes. Your site visitors can register for an account and submit their own recipes, bookmark other people recipes and engage in conversations using comments and recipe reviews. You will boost your SEO rankings because our theme fully utilizes Google Rich snippet meta data. Full support for a â€œMailChimp for WordPressâ€ to include a newsletter widget right into a sidebar.